While at first glance it may seem that Germany has little to offer in terms of Prehistory, there are nevertheless several interesting locations and artefacts that are now giving German prehistory the significance it deserves. Hohle Fels: Bone Flutes, Venus figurines, carved ivory. This bird-bone flute unearthed in the Hohle Fels cave was carved some 35,000 years ago and is the oldest handcrafted musical instrument yet discovered, archaeologists say (2). The Hohle Fels flute is more complete and appears slightly older than bone and ivory fragments from seven other flutes recovered in southern German caves. It is but one of several exquisitely crafted discoveries form this fascinating cave. 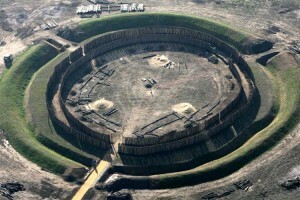 5,000 BC - Goseck, Germany - Currently the oldest known solar observatory in the world. Located on the same Latitude as Stonehenge and 12° to the east. This recently restored Henge monument demonstrates an awareness of the solar cycle, and the simple step required to mark the day end/start point of each cycle. The two southern entrances would have illuminated the centre at both the rising and setting sun each winter solstice (the wooden posts reduce the beam of light to a narrow shaft). The northern entrance was the main entrance to the site (The bottom entrance on the photo left). The pillar has the appearance of a squared metal bar, about 1.47 m above ground and approximately 2.7 m below ground. It was first mentioned in a document in 1625 as part of the border line between Alfter and Heimerzheim along the Roman aqueduct. Associated with the Iron man are an ancient stone walkway and the remains of an aqueduct which runs straight towards the pillar. The 'Iron-man' also shows very little sign of rust, and its actual origin is unknown. Although the origin of this pillar is unknown, the technique and the style point to a date of manufacture in the late Middle Ages. 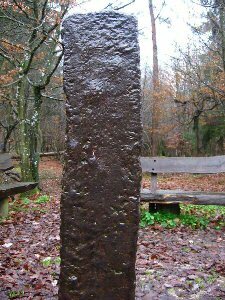 (1) This metal pillar, along with the Ashoka pillar in India are often classified (erroneously) as anomalous artefacts. Found at the top of a mountain in Germany and long believed a fake, this remarkable object is now accepted as a genuine artefact. It is the only piece of its kind in central Europe and includes astronomical information relevant to its location. 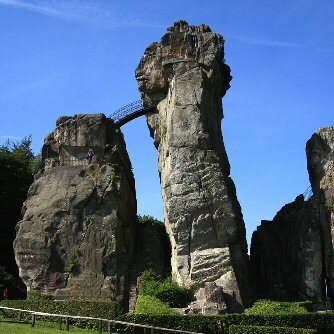 The Externsteine ('Ecce'-Mother / 'Stan'-Stone) is a distinctive rock formation which was a centre of religious activity for thousands of years before the arrival of Christianity. 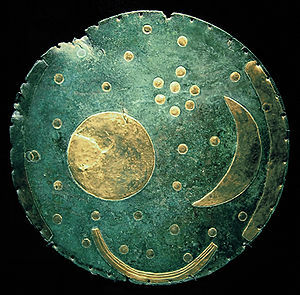 Although archaeological excavations have not produced any findings earlier than the 11th century BC, other than some Palaeolithic and Mesolithic stone tools dating to before about 10,000 BC (4) it is likely that the site was occupied between these dates too. 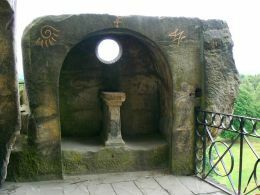 The Externsteine is also famous for its inaccessible mountain top temple whose alter is illuminated by the winter solstice sun through a circular hole in the cliff wall. Walkway leading to Solstice hole. 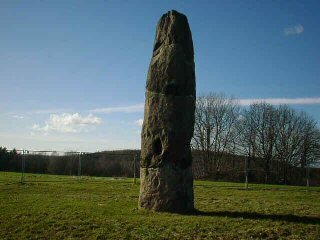 The Gollenstone: (Goldenstein and Güldenstein). It is estimated to weigh around 100 tons. 4). 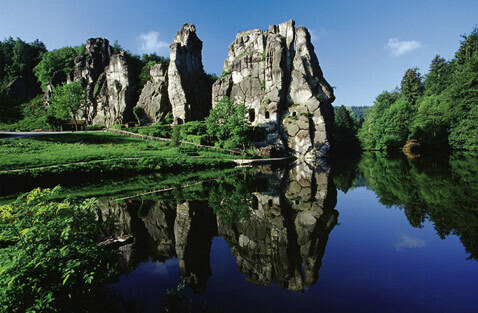 Mythology: Externsteine. germany-tourism.de. http://www.germany-tourism.de/ENG/culture_and_events/mythology_externsteine.htm.